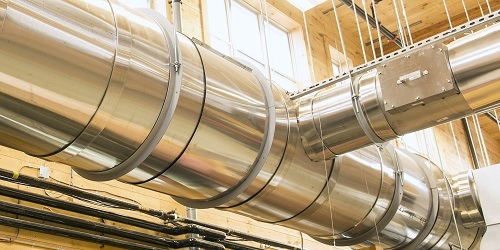 Spring Air Systems is a distributor of the Van-Packer line of pre-fabricated and listed grease ducts, manufactured with precision and known for their versatility. They’re easy to install and an ideal fit with all of our mechanical components in wide range of kitchen and building environments. Designed and constructed for commercial kitchen exhaust systems with zero clearance to combustibles for any diameter of ductwork. 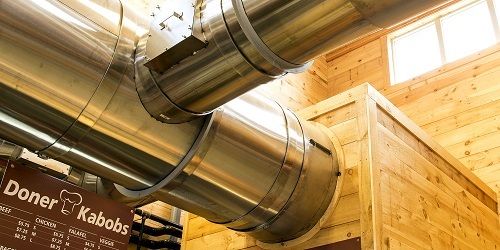 Lower installation cost than typical fire-wrapped, field-welded exhaust ducts. Available with aluminized or stainless steel outer shell that provides attractive finished appearance. Tested and listed liquid-tight joints reduce installation time. DW is standard with 1" air space between the liner and shell which provides reduced clearance to combustibles from 6" to 17" depending on the duct diameter.